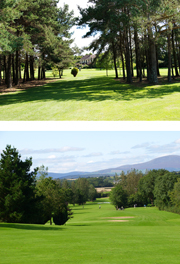 Situated in the historic town of Enniscorthy, the club was founded in 1907 and was extended to 18 holes in 1990. The fairways are generous and the course has many beautiful old trees which will give the golfer that extra degree of difficulty. This parkland course with its gentle undulating fairways affords magnificent views of Wexford's rolling countryside and the Blackstairs Mountains. A very beautiful and testing 18 holes it has been described by course architect, the late Eddie Hackett, as a "joy for the average golfer and a test for the expert". The spacious modern clubhouse offers a full range of facilities, and a warm welcome and friendly atmosphere awaits all visitors.